On my needles still the Dragonfly Socks. On my kindle Neverwhere by Neil Gaiman. It feels as though I have been working on these socks forever but that is mainly because I keep putting them to one side while I do other things. Like start my very own Etsy shop! That has been very exciting and has been keeping me busy. I have a blog post bubbling away in my mind about how I have come to be selling my creations but I haven’t had time to write that either! Anyway, sock number one is finished and looking beautiful on my stunning new sock blockers I bought from here. And number two is round the corner and on to the gusset so coming along nicely but I really do need to prioritise this as they are intended as a Christmas gift. I just find myself brimming over with wreath ideas that I want to make and so its a bit of a struggle to work on socks however lovely they may be. I have read quite a bit of Gaiman this year and am loving this one. My husband is listening to the audio book and I really enjoy it when we are working on the same book at the same time and can chat about it. Linking up with Ginny and the other Yarn Alongers sharing what they are working on and reading. On my hook, tiny snowflakes and penguins. On my kindle The Year of the Runaways by Sunjeev Sahota. There has been snow across a lot of Northern England today, but not where we live. There was a small dusting when we woke this morning but by 8am there was just a persistent, freezing rain which has washed all traces of snow away and dampened our spirits. So my family has all been gathered together in the kitchen, warming ourselves by the aga. The children have been continually grazing on nuts, like little squirrels preparing for winter, and playing with small world toys. I have been crocheting the final details for this frosty mini wreath while wishing there was a similar winter wonderland outside the window. I have nearly finished the Year of the Runaways and still finding it close to unbearably sad whilst somehow astoundingly beautiful. I think I might miss it when it is done but am looking forward to reading some lighthearted silliness next. Linking up with Ginny and the other yarn alongers. 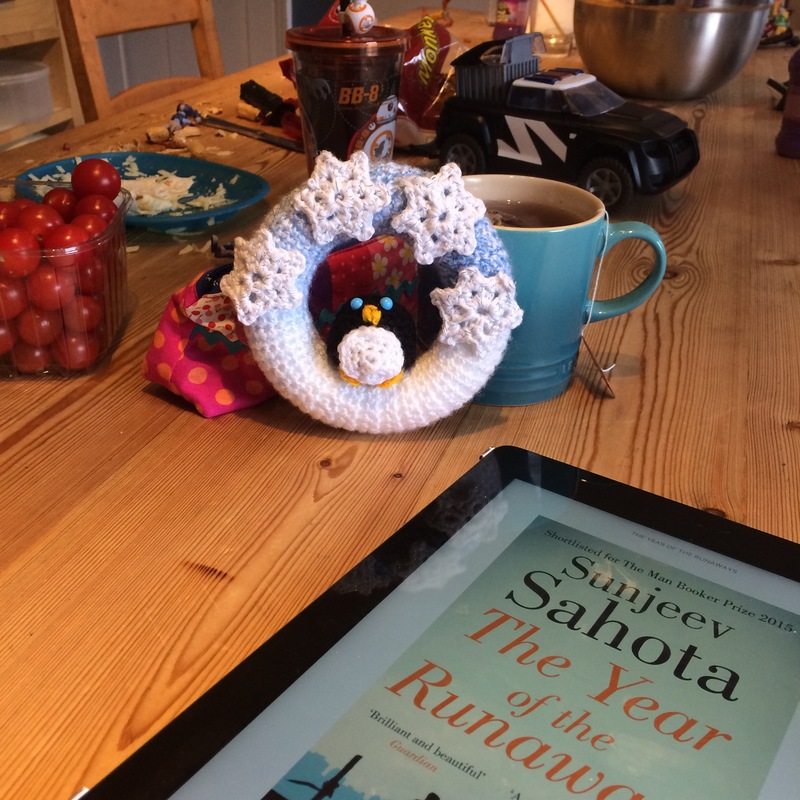 On my kindle The Year of the Runaways by Sunjeev Sahota on my hook holly leaves. This book is beautiful. But very sad. Its a tough read but I am appreciative of the skill of the author. I’m still working on wreath bits and love these little spiky leaves. I’m also feeling rather nostalgic as I whip them up. Last night as I sat with a glass of wine, chatting to my husband about his day and a holly leaf just happened I remembered sitting in front of the laptop around this time last year agonising over every stitch of what was the first crochet item I successfully made, little holly leaves. This exceptional tutorial from the uber talented Attic24 is so clear that even a complete novice can follow it. Although I have noticed that this year’s leaves are a lot less wobbly than those first attempts! Pretty much all I seem to be talking about at the moment is my mini wreaths but here’s another post about them! I’m so excited to see them coming together and am getting very close to being able to offer some for sale. I’ve set up a Facebook page to help me with promotion which you can find here. Do you remember my little owl who sits in a Mini Autumn Wreath? I will get round to writing up the pattern soon but he now has two new friends, also from patterns I have bodged together designed. Meet teeny tiny penguin and teeny tiny Robin. I must get some photos of these guys with a coin to show you the the scale but the light is fading fast here so that will have to be a job for another day and today you will just have to take my word for it that they are very small! They will hopefully have wreath to sit on in the next day or two but here’s another owl based one I finished yesterday. I’m really pleased with the way this one turned out. But now I must get back to crocheting! See you tomorrow for Yarn Along.